At the present time in Israel you can find evidence of ancient techniques of cultivating fruits and vegetables using a system of hillside terraces bordered with stone. Viewing these terraces is easy around the mountains of Jerusalem, where a system of springs, channels and terraces, accessible by hiking trails, has been reconstructed at Sataf as well as at the En Hemed National Park. 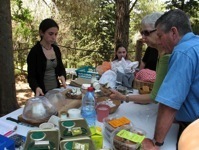 Before we start our hike though, it would be fun to stock up on some provisions at the Har HaRuach Goat cheese farm above the village of Abu Ghosh. After a 30 minute drive from either Jerusalem or Tel Aviv, exit Route 1 at Abu Ghosh/En Hemed, drive through the village and then follow Route 425 in the direction of Nataf and Ma’Ale Hachamisha. Before the very top of the hill, turn left toward Nataf and travel about 4 kilometers, entering the Forest in Memory of Polish Jewry on the left. It’s then a few more kilometers on a winding gravel road toward the farmhouse on the ridge in front of you. The farm is owned by Haim and Dalia Himmelfarb, who with the help of their two girls, sell a variety of natural and goat cheeses, yogurts and labane on Fridays, Saturdays and holidays, starting at 10 in the morning. Haim and Dalia are graduates of the Bezalel academy, but yearning for a change in their lives, moved to the hillside village of Nataf to establish their nearby farm in 1996. Today the Himmelfarb’s own 140 goats that graze on 1500 dunams of pastureland. Goat and sheep cheese has been a mainstay of the local population in the hills surrounding Jerusalem since Biblical times, and the quality of the grass is comparable to pastures found in European countries bordering the Mediterranean. 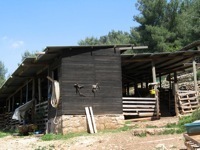 With prior reservations, you can attend Dalia’s workshop on the history of cheese making in the Jerusalem hills, as well as lectures on related topics (054-493-34566, 02-534-5660). After purchasing a picnic basket with your bread, cheese, yogurt or milk you can wander around the barn, perhaps pet the goats roaming the hillside, and then enjoy a snack under the towering evergreens. Now retrace your drive through Abu Ghosh toward Route 1, but instead of entering the highway, cross the bridge to the entrance of En Hemed National Park. 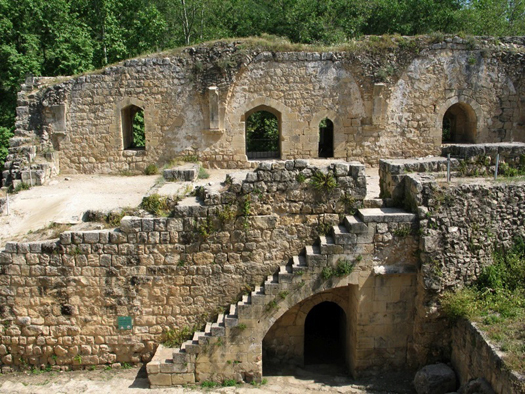 En Hemed is also known in Latin as Aqua Bella, so named by the Crusaders who built, what some archaeologists surmise, is a fortified farmhouse adjacent to the Kisalon stream. The wooded area and adjacent olive grove beautifully frames the high walls of the surviving structure that was built during the period of King Fulk of Anjou, between 1140 and 1160. Upon conquering Palestine in 1099, the Crusaders built a series of large castles and fortresses on strategic routes, as well as smaller dwellings that served as rest stops for pilgrims. Also, by adopting the feudal system of land ownership that was so well known to them from Europe, the Crusaders awarded noble families tracts of land that were often used for agricultural purposes. While standing inside the courtyard of this fortified farmhouse you can admire its thick walls, the surviving staircase, the tower with its loopholes and the beautiful windows on the second level. It is one of the most beautifully preserved artifacts from the Crusadrer period and certainly merits a stop on your Israel tour. From that vantage point it would have been possible for the residents of the farmhouse to observe and be observed by Crusaders stationed at the nearby Belmont Castle. As you enter the Eastern hall, note remnants of an olive press and a niche in the wall, which would have supported a wooden beam attached to the press. From the farm house you can continue on a thirty to sixty minute walk along the stream, noting the numerous springs, manmade channels, and unique remnants of the Mediterranean woodland with it’s oak trees and Palestine Buckthorn. 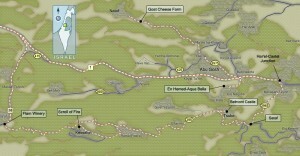 From En Hemed it’s a short drive on Route1 to the Harel/Castel exit and then south on Route 3965 to Sataf. Park your car in the upper parking lot near the information booth where excellent written materials of the five walking trails can be obtained. 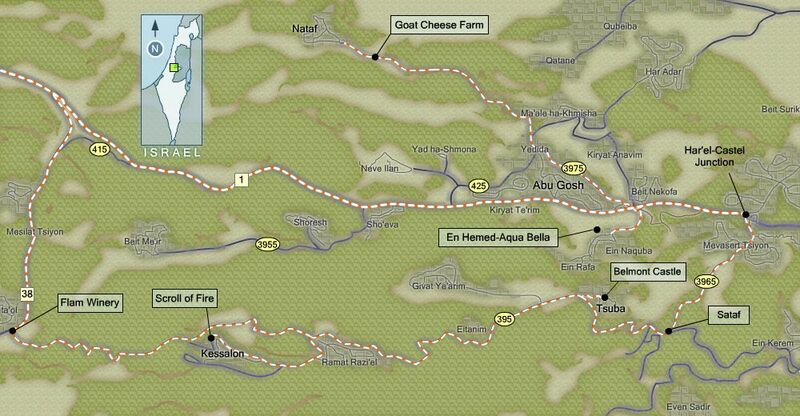 For hikers, this is a must-see stop during their Israel trip. 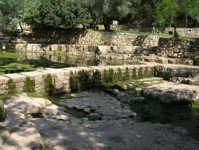 Sataf was originally settled during the Chalcolithic Age, and it’s ancient system of terraces dates back 4,500 years. The early inhabitants of the site moved stones to the edge of the natural terraces where they built retaining walls for the imported fertile soil that they used as fill. The two streams emanating from the slopes of Mt. 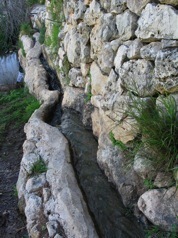 Eitan were used to channel water to plots where crops were grown. 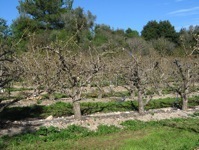 Other terraced plots, where olives, figs, almonds, pomegranates and vineyards were harvested, relied on seasonal rains. The remaining stones were used to build watchtowers from which the farmers could keep an eye on their crops. My beloved had a vineyard on a very fertile hill. He dug it and cleared it of stones, and planted it with choice vines; he built a watching place in the midst of it, and hewed out a vineyard in it. Though there are several walking trails of 2 to 3 kilometers in length that can be followed, perhaps the full path marked in green is most interesting. All the trails at times can be steep and are strewn with rocks and stones, making good walking shoes essential. Starting at the upper parking lot, the trail follows an ancient route descending through olive groves and cultivated plots, along Chalcolithic archaeological excavations down to the former Arab village of Sataf. At the middle of the 19th century the population of Sataf numbered about 450 individuals, and today what little remains of these homes attests to their previous beauty. The village was abandoned in 1948, and was later used by the Israeli Defense Forces as a training area. Since 1985 the JNF/KKL has been restoring the area to its biblical past, and should be most interesting to visitors participating in holyland travel. 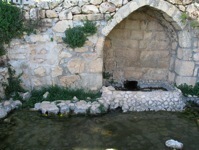 After passing the ruins you can make your way down to Ein Sataf, the main spring in the village, and from the terrace above the pool, descend into the cave from which the spring issues. Then, by stooping, you can traverse a tunnel to its other end. The water, which flows through the tunnel, ends at a pool with a capacity of 180 cubic meters from which farmers could regulate the flow of the water into the man- made plastered irrigation channels. Further along the path you can view the Eretz Israel Tree Garden behind a wall and an iron gate. There, an effort is underway to traditionally cultivate the country’s original species of fruit trees. As you descend, pass the cultivated plots where organic crops are grown, and make your way toward the Bikura spring. On the way you can observe another traditional means of cultivation when space is limited, the use of hanging stairs from the terrace walls. You can then complete your hike by following a traditional mountain trail past walled vineyards following a path to the upper parking lot. There you will find a most welcome site, a restaurant serving full course meals, from which you can admire the beautiful hills of Jerusalem and the trail from which you have just ascended. Truly one of the most beautiful attractions in Israel! As you depart Sataf, return to the circle and follow the signs for Route 395 leading you to Kibbutz Tzuba. Enter the industrial grounds of the kibbutz and keep to the right, driving up the hill past the kibbutz hotel. The impressive castle on the hill will be to your left and you can park your car under some shady trees before making the rest of climb by foot. It should be noted that this site is in the process of becoming a national park and that some of the area around the ruins are overgrown with weeds, which may hide some holes and gullies. It can be easily understood why the Crusaders chose to name their castle Belmont, beautiful mountain. 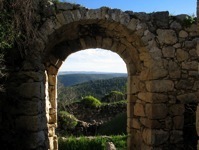 Indeed the views over the hills of Jerusalem through the arched windows and doorways of this ruin are magnificent. Note also the vaulted chambers, fireplaces, and the placement of the windows which permitted the inhabitants to enjoy dramatic views from many vantage points. 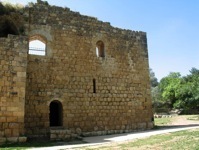 The site of this castle, high on a hill overlooking one of the roads leading into Jerusalem from the West, attests to its strategic military importance through the ages. 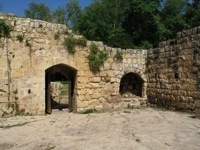 However, the Crusaders held this fortification only until 1191 when Saladin overran the position and destroyed it. Subsequently, the site and the surrounding area became home to several Arab villages. During Israel’s War of Independence the Palmach, Harel regiment, under the leadership of Yitzhak Rabin, successfully routed the invading Egyptians from Belmont. This action ultimately led to the capture of the nearby fortification known as Castel and the reopening of the road to Jerusalem. As you retrace your steps into the Kibbutz, you may wish to stop at the hotel for a meal, a beverage or just to enjoy the view from its terrace. The hotel may also be able to arrange for a tour of the “Cave of John the Baptist” which was found on its grounds. The cave was originally part of a large water system hewn from rock during the 8th century BCE, and was later used as a reservoir and baptismal site. Archaeologists now assert that in the Fifth or Sixth centuries CE Christian monks incised drawings on the walls of the cave depicting images dealing with the life and death of John the Baptist. As you exit the industrial area of the Kibbutz turn right into Route 395 toward Eshtaol. You will now drive through some of the most beautiful mountainous countryside that central Israel has to offer. The latter part of this road will take you through a narrow, winding and forested ravine, making you believe that you are elsewhere in the world. Prior thereto, you can turn at the circle directing you to Kessalon and travel three kilometers to view the Scroll of Fire. This outstanding sculpture is located in the world’s largest memorial to the Holocaust, the B’nai Brith Martyrs Forest of six million trees. 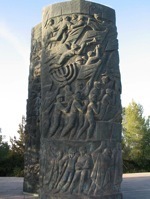 Nathan Rapoport has vividly depicted the plight of the Jews in the Holocaust and their subsequent struggle to establish the State of Israel in his dramatic design of the sculpture. Travel to Israel certainly merits a stop at this moving memorial. As you approach the end of your travels on Route 395 near the Eshtaol junction, consider making one last stop to memorialize your agricultural experiences in the hills of Jerusalem with a purchase of an excellent bottle of wine at the Flam winery visitor center and some wonderful spices from the immense collection at the adjacent store. At the junction, a right turn will lead you back to the Jerusalem Tel-Aviv highway.